Malachite is a form of copper ore that doesn't look coppery at all. It's name is derived from the Greek word, molochitis, which means "mallow", a green herb. With its distinctive deep green bands, malachite provides gemmy green for a fraction of the cost of emerald, high-quality tourmaline or demantoid garnet. Because it has a Mohs scale rating of only 3.5-4 (compared to diamond's 10), malachite is suitable for set pieces such as earrings or a necklace, but too soft for a bangle or some ring designs. 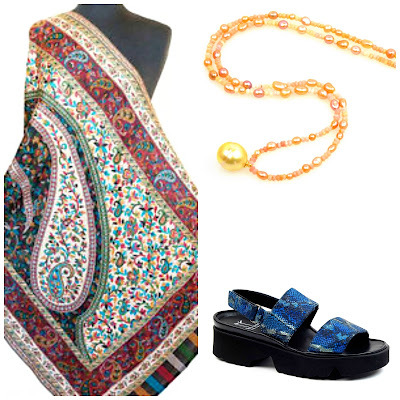 It mixes beautifully with stones such as coral, mother-of-pearl, azurite, jasper and onyx. However, with a bezel setting, malachite endures; here's my Scandinavian style malachite ring, at least 50 years old and wearing well. 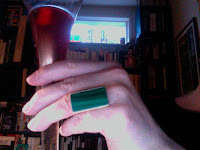 I'm enjoying a nice restorative apéritif, rosé champagne and yes, it IS after 5 pm. as I write. 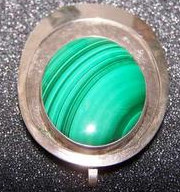 Mal achite is not a costly mineral; you can find tons of cheap malachite jewelry. However, when well-designed and set, this stone comes into its own. A three-inch Cartier lighter with a gold Bacchus head, ruby cabuchon eyes and malachite base sold at a Christie's auction last year for over $3,000. 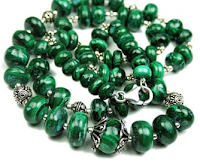 24" malachite wheel beads and silver beads, $96.30 from Semiprecious.com. This necklace would layer well with a silver chain, and has enough presence to stand alone. An exotic 18-inch Onyx and Malachite Bead Necklace B lack (bead detail shown left) combines faceted black onyx and carved malachite beads, spaced with discs of 18k vermeil, $295 from Ross Simons. Flattered by the sensuality of silver, malachite is a favourite material for Native American designers. I'm discerning about my Native pieces. This 1950's pendant by Hopi artist Sekayumptwea Wally is special. His work was exhibited in the Museum of Northern Arizona between 1950-1960. $250 BIN price from eBay seller inthelandofenchantment. An 18 mm x 13mm (11/16th-inch) gracefully curved stone, simply mounted in 14k gold, puts a deep green pool on your finger. $250 from Ross Simons. listed on her Belladora II site. 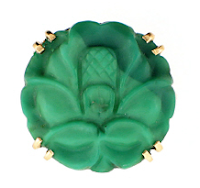 The first is a '70s carved malachite flower, 17mm, set in 14k yellow gold, very 'lady' but not too sweet, $335; size 5. 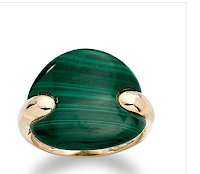 The second, from the same era, is a crisply-tailored gold and malachite slightly domed gold ring with crescent-cut malachite sides, $346, size 6, with a Cartier vibe. Either, worn with a black sweater framing that vivid green, is a signature accessory that lifts a simple ensemble. Ideal for some one beginning to collect fine jewelry, or for a splashy gift, these 5/8"-diameter gold-plated hoops by Viv & Ingrid are just $75 from Twist. Malachite and onyx in statement earrings: 14mm x 11mm malachite discs hanging beneath 16mm x 12mm onyx discs, hanging length 2 1/8", set in 14k yellow gold; $150 from ice.com. International shipping. A video feature on the listing allows you to see how the earrings move. 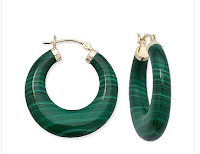 Ross Sim on's malachite hoops (1 1/8" diameter) show off a range of banded greens, and are set in 14k; for $125, a tempting treat. 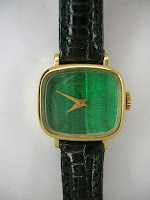 Gucci Malachite Dial Gold Signoria Watch, $5, 045 (sale price) at Authentic Watches, features 18k horsebit links; I love its Belle de Jour charm. The Signoria is also sold in silver ($1,226 on sale at Certified Watch Store). Vint age watch dealer Finer Times offer a sumptuous yet simple manual Longines watch, in near-mint condition, with a malachite dial and 14k case for $535. Want fla sh and rock-solid wearability? 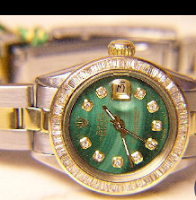 This Rolex Ladies Rolex DateJust Malachite TwoTone Oyster $5,399 from Best of Time has a baguette-diamond 18k bezel and a two-tone 18k and stainless steel bracelet. An assertively glam watch that stands up to serious wear. 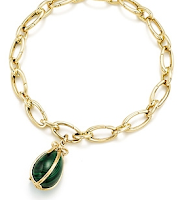 If I were starting a charm bracelet, I would choose the Tiffany Jean Schlumberger 18k link charm bracelet, $1,500, and add a malachite egg charm, $900, inspired by a pendant for the 1960s. I'm not desirous of Tiffany charms in general– too twee, but this one... charms. So far I have just the ring, but malachite's in my sights. The semi-precious gems are a good buy, if set with care and workmanship. Lovely pieces, Duchesse. Your ring is stunning. 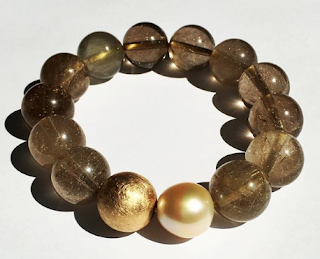 I've become a fan of semi-precious stones...lots of bang for the buck. I've eyed that second Beladora II ring, but alas it's a size too small. So much information Duchesse, thanks! Green is not me, I´m afraid, but Deja; can´t that ring, I mean if you really are interested, be altered to fit you, would the color match your Lancel bag by any chance? Mmm. Love Schlumberger charms. Some things transcend their nature. Pseu (and metscan): Can't tell if ring can be sized, depends on how far malachite extends. Did you ask Belle? Belle: That's a new Gucci watch, it just looks vintage. LPC: Yes, Schlumberger is my favourite of the Tiffany lines. 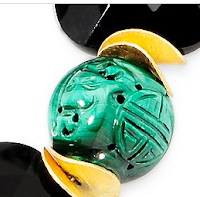 Oh, I love malachite and had no idea it was so reasonably priced. I'm going to see if my red-headed (dyed) daughter would like something. She looks great in that color. Thanks for the continued education, Duchesse. I learn a great deal reading your blog. Beautiful "stuff." I always thought of malachite as a pretty but cheap stone. These pieces are wonderful and I have changed my mind about it. Thanks. I became enamored with malachite and lapis lazuli after visting St Isaac's Cathedral in St. Petersburg. The church has tall columns made of malachite and lapis that are breathtaking. Frugal: Perhaps the silver and malachite beads? She would look "divine" in malachite. Lindy: That just have been thrilling! s., Thanks, I enjoy putting them together. Ms Maven: Well there is a lot of junk out there but it's the fault of the design and fabrication, not the malachite. Alienne: If your investigations turn up a piece you like, please let us know. Pardon me for being a bit off topic but last night as I waited between trick-or-treaters I reviewed your entire site! What a treat! 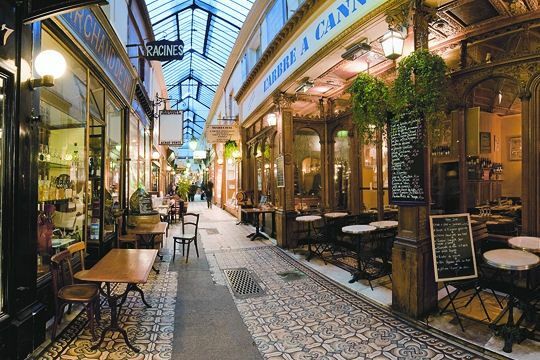 My favorite post of yours was on the French plus-strict style of dressing. For the last few years I have been working to develop that style for my closet without consciously knowing that it is a style, and where to source it. If this subject is still of interest to you, I'd love to see you do an updated post on the subject. Those Ross Simon hoops are just edibly gorgeous. Laurie: The subject is of interest but little else really can be said. This is a subset of minimalist-classic attire you see rarely- and even more rarely in North American where a large population of women adore colour and girly details. Well maybe I can work up another post, thanks for asking!